The Current System and Calculation. Your Handicap Differential is the Adjusted Gross Score you enter after you play minus the SAGA/WGSA Course Rating of the tee you played. So, if you entered 90 on the system and the SAGA/WGSA Course Rating of the tee you played was, say, 69 then your handicap differential would be 21 – and that is what you see when you look at your handicap scores on the system. When we calculate your handicap we take the best 10 of the last 20 differentials and average them, and multiply the average by 0.96 before rounding the number to the nearest whole number. You can see in the below example, a player with 20 scores in the system and what his/her current handicap calculation is. On the night of the 2nd of September 2018, we are going to take all 20 of your latest scores in the HNA system and recalculate your differentials using the new USGA Course Ratings and the Slope Rating of the tee that you played. So the new Differential calculation will be (Adjusted Gross Score – Course Rating) *113/Slope. In the above example, the new table of Differentials will be as shown below. You can see that for the same Gross Scores the Handicap Index is lower, due to the USGA Course Ratings, which are higher than the existing ones, as well as a Slope adjustment. But don’t worry, the calculation of a Course Handicap, which includes Slope, reverses some of the above adjustment as you can see below. Also remember that all the handicaps are being adjusted, not just yours, so you will be just as competitive as before. So, how will you know what your Course Handicap will be when you arrive at a club to play on the 3rd September? 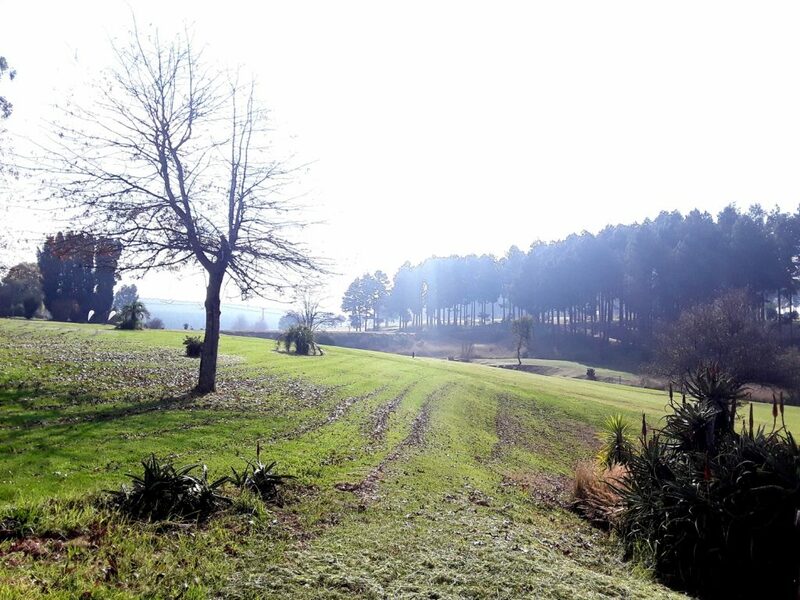 As you can see, the calculation adjusts the Handicap Index for both the Slope of the tee and the Course Rating of the tee, so from the 3rd September you will not have to adjust your Course Handicap when competing with other players off different tees. In the example used above, the player has a Handicap Index of 15.4. 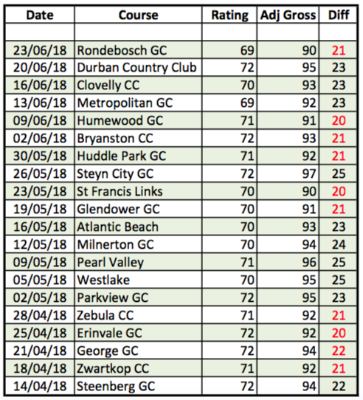 This player can then look up his/her Course Handicap from a table similar to the one shown below for Durban Country Club, which will be displayed in the Pro Shop and on the noticeboard at each course. If the above golfer is male and he chooses to play the White Tees, his Course Handicap will be 18. If the above golfer is female and she chooses to play off the Red Tees, her Course Handicap will be 20. 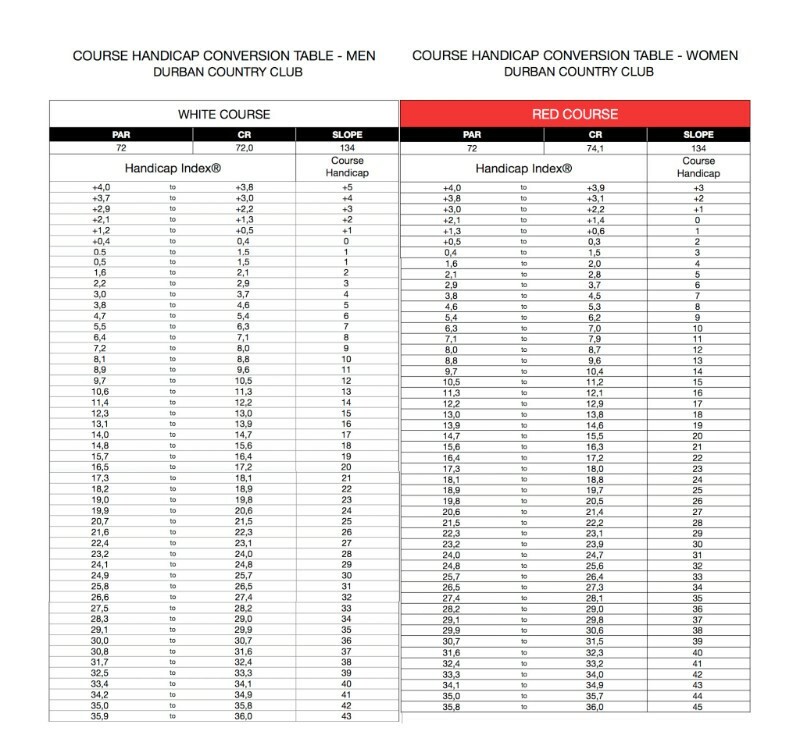 For those courses with a computer system, the Club will print out the Course Handicap for you when you register and pay. Your Course Handicap will also be shown on your HNA Handicap phone app once you select a course and a tee. The terminal at the course will also give you a Course Handicap on entering your Handicap Index and the Tee. While this is quite a big change to get used to, it is currently in use in all countries except the United Kingdom. Once the UK has completed its Slope Ratings, it will use the same calculation and the whole world will then be on one system. If you have any questions please don’t hesitate to email Handicap Network Africa at editor@handicaps.co.za. 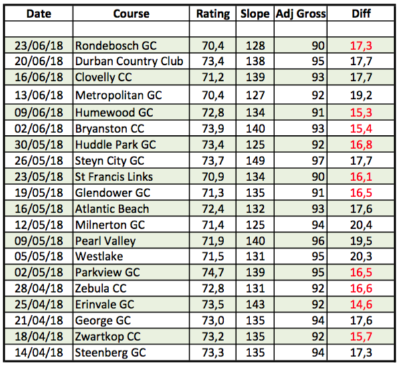 Click here to view the South African GOLFERS’ GUIDE to the USGA Course Rating System, covering Course and Slope Rating and the Calculation of Handicaps.